More book reviews than the truck can handle. Aliens are a staple of science fiction books and movies, but they don't really exist...right? There are many people all over the world who firmly convinced about the existence of UFOs and aliens. Alien Investigation traces accounts of unidentified flying objects from the 19th, 20th, and 21st century. What's the truth about UFOs and aliens? You might be surprised. As someone who watched a lot of X-Files growing up (and last summer, when I re-watched the series), I'm really excited to see books like this for a middle grade audience. It's a great age, where kids are thinking critically but also open to exploring fantastical concepts. Alien Investigation summarizes a lot of the historical evidence and reports about UFOs and aliens. The question is not 'will this book convince skeptics about the existence of UFOs?' (Would any book convince skeptics about the existence of UFOs?) Instead, a better question is 'what kind of information will readers find in this book, and how valid is it?' Intensely researched and brimming with eyewitness accounts, news reports, and expert opinions, this book presents a lot of information in an accessible way that can spark or flame an interest in the supernatural. It's a great addition to any library's non-fiction section. Check out Kelly Milner Halls' website - lots of cool stuff! I received an advance review copy from NetGalley courtesy of Lerner Publishing. 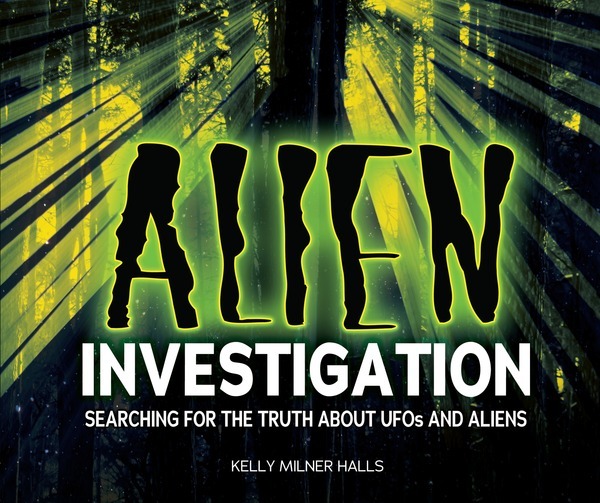 Alien Investigation is scheduled to be published on April 1, 2012. LOVE your review of ALIEN INVESTIGATION. Thank you so much. It is available now, too! All opinions are mine and do not reflect the opinions of anyone that I work for or anyone who has sent me a book for review. My blog name comes from people crowding re-shelving trucks in the library, eager to see what other people were returning. There's an excitement in finding out what other people are reading, and it's a great way to get ideas for what to read next. For each title, I've listed a few other books under Read It With. These are titles that are similar in some way: plots, tones, themes, settings, characters, and so on. They're not straight-up read-alikes; for example, sometimes a juvenile book might have a picture book, a YA book, or an adult book listed. There's not really a science to how I come up with them - they're just meant to spark something if you're interested in a title. Who's Sharing Crowding the Book Truck?